The Petes welcomed the North Bay Battalion to town for the 7th Annual Saves For CF Night. 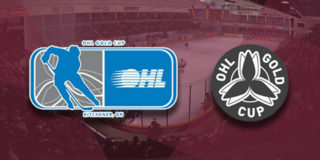 Coming off of an overtime loss to the Oshawa Generals, the maroon and white were looking to get back in the ‘W’ column in front of a sell-out crowd. In the end it was the Battalion who came away with a 7-2 victory, although Petes fan Barry M. from Fenelon Falls also went home happy, scoring the $7,835 jackpot in the record-breaking 50/50 jackpot. The first goal of the evening came at 5:45 on the clock as North Bay’s captain and leading scorer Justin Brazeau took an assist from Nick King to score his 40th of the season, putting the Troops ahead 1-0. At the end of 20 the Battalion had the lone goal, although the Petes held the shots by a slim 16-13. 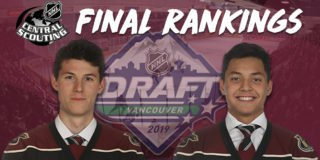 The second period was also quiet until the 11th minute when the Petes themselves got on the board to tie it 1-1 courtesy of a Nick Robertson goal assisted by future Leaf Semyon Der-Arguchintsev and Sharks prospect Ryan Merkley. Shortly following Robertson’s goal the Petes were down several men to penalties. The Battalion capitalized as Brad Chenier directed to Matthew Struthers who fired the puck past Jones to put North Bay up 2-1. With 3:14 left on the clock, North Bay increased their lead to 3-1 as Kyle Jackson scored unassisted. The clubs would go to their rooms after 40 with the Battalion in the lead by two goals even though the Petes remained in firm control of the shot clock 36-23. The Battalion would once again open the scoring in the early stages of the third period with an unassisted goal by Harrison Caines to increase their lead to 4-1. If that wasn’t enough, the Troops rallied to make it 5-1 as Jackson scored his second of the night, this time assisted by Brazeau and Struthers. The Troops sunk their third of the period to make it 6-1 when Brazeau and David Maier found Chenier to increase North Bays already considerable lead. The Petes would attempt to come away with at least a little confidence as Cameron Butler took the puck from Adam Timleck and the night’s first goal scorer, Robertson, to make it 6-2. North Bay would add insult to injury as King tallied their seventh of the night with the assistance of Zack Malik and Mason Primeau. With Kings goal securing the victory, North Bay would hand the Petes their second loss of the week. All was not lost as the Final shots were 52-30 in favour of the Pete with Hunter Jones saving what would add up to a total of $23.00 for Cystic Fibrosis Canada . Christian Propp, Jackson, and Brazeau of North Bay would be named the game’s first, second, and third stars, with Erik Cermak of the Petes named the Mark’s Hardest Working Player of the Game. The Petes finish off their homestand against Ryan Merkley’s former team, the Guelph Storm, on Thursday, January 17th at 7:05pm. Tickets are available through the Baker Tilly Box Office in person, over the phone at (705) 743-3561, and online. 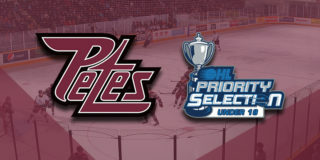 Petes Holiday Flex Packs are still available while supplies last. 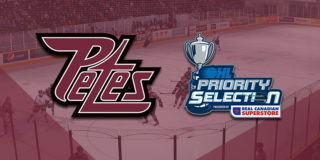 For just $59.99 (tax included), fans will receive two Petes holiday mugs, two $2 Tim Hortons Tim Cards, and four flexible ticket vouchers to be used for any Petes home game in January. The regular price of this package is $118, which means fans save almost 50% on the special offer. Contact Mike at (705) 743-3681 x 263.